OVERVIEW: We forget to pay tribute to a group that protects the future of our society. They are the school crossing guards--part of our nation's Terror Watch Group. But they are unsung heroes. Now is the time to salute them. GROUND ZERO PLUS 1063 DAYS, New York, NY, August 8, 2004--There is something special about being on Terror Watch. You are working for the children. I've always given high honor to the School Crossing Guards. If one thinks about it, a most dangerous act for most children is crossing a street. Cars whipping madly here and there to shove themselves and thousands of pounds of metal to work often are too busy drinking coffee, talking on cell phones, and a myraid of other things careening about their minds to be alert to children crossing the street. Parents may bow to the men and women in blue, the police who patrol with guns and batons, but the unarmed School Crossing Guard is the real unsung hero of the Terror Watch Group. Their job is keep children from being run over by the madding crowd of trucks, cars and buses hurling from point "A" to point "B." According to the U.S. Census Bureau there are 53.3 million children -- 36.8 million of elementary school age (5-13 years) and 16.5 million of high school age (14-17 years). Their lives, in part, are being protected by the School Crossing Guard. The point of the story is simple: Do you know your School Crossing Guard is a Sentinel of Vigilance, on constant duty as a Terror Hunter, warding off the invasion of vehicles eager to run a red light or forgetting to pay attention? If not, give your School Crossing Guard a salute next time you see one and say thanks. 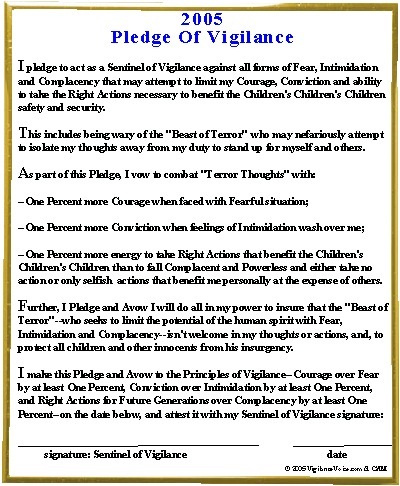 Vigilance is about recognizing the little things in life...and honoring the people who do the most for the future of the children. 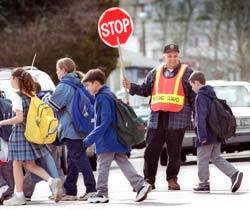 Crossing the street is like swimming with sharks, and the School Crossing Guard knows better than to trust any driver. He or she guards children, grandchildren, nieces, nephews, neighbor kids, loved ones. Everyone owes the School Crossing Guard the tribute of Sentinel of Vigilance. Salute them next time you see them. And, most importantly, be wary of children on the streets. Go To August 7 "American Pregnant With Terrorism Is Giving Birth To Vigilance"